"And it shall come to pass in that day [which is now] that the LORD shall set his hand again the second time to recover the remnant of his people, which shall be left [from them that had gone astray], from Assyria [Iran and Iraq] and from Egypt, and from Pathros and from Cush, and from Elam and from Shinar, and from Hamath, and from the islands of the sea. 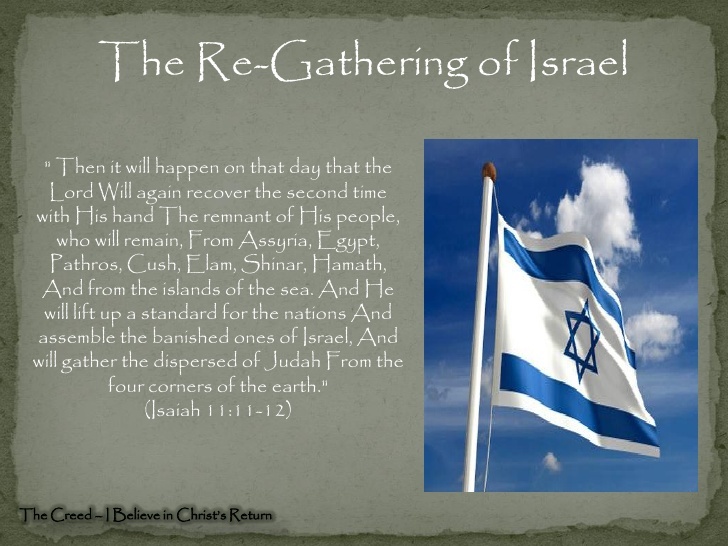 And he shall set up an ensign for the nations, and shall assemble the outcast of Israel [Covenant-breakers], and gather together the dispersed of Judah from the four corners of the earth (Isaiah 11:11, 12)." The ensign, or standard for the nations is the genealogy of Baha’u’llah back to Jesse the father of King David. "And there shall come forth a rod out of the stem of Jesse, and a Branch shall grow out of his roots" (Isaiah 11:1). The stem of Jesse is his (Pray I have a proper word) and the sperm that came out of the stem, by uniting with an ovum, produced King David. The rod pertains to the scepter of authority of King David, as he was chosen by Samuel (I Samuel 16:11-13). "I have found David my servant; with my holy oil have I anointed him" (Psalm 89:20). In Psalm 89 God said: I have made a Covenant with my chosen, I have sworn unto David my servant, Thy seed will I establish for ever, and build up thy throne to all generations (verses 3, 4). My mercy will I keep for him for evermore, and my Covenant shall stand fast with him. His seed also will I make to endure for ever, and his throne as the days of heaven (verses 28, 29). My Covenant will I not break, nor alter the thing that is gone out of my lips. Once have I sworn by my holiness that I will not lie unto David. His seed shall endure for ever, and his throne as the sun before me. It shall be established for ever as the moon, and as a faithful witness in heaven (verses 34-37). Baha’u’llah is a genealogical descendant of David and is seated on the throne of David. He said He was the Ancient Root. ’Abdu’l-Baha is the Branch grown out of this Ancient Root, and verses 2-5 of Isaiah 11 pertain to ’Abdu’l-Baha. ’Abdu’l-Baha had both natural and adopted sons. An adopted son has all the rights and privileges of a natural son, including the kingship. It is this specific lineage of King David, entitled Aghsan (Branch) through Baha’u’llah and ’Abdu’l-Baha which is to last for ever. This genealogy of Baha’u’llah will be an ensign of the people because it is to exist forever. When Baha’u’llah appointed His son, ’Abdu’l-Baha, to succeed Him, this genealogy of David was passed on to him, ’Abdu’l-Baha. ’Abdu’l-Baha then passed this genealogy on to his son that inherited the throne of David after him and today, the great-grandson of ’Abdu’l-Baha is the living descendant of king David alive in the world today seated upon the throne of David which is to last for ever. He or one of his successors in this same lineage will be President of the Universal House of Justice of Baha’u’llah when it reaches its fourth and final stage of the fully elected body from all the nations of the world which shall be Baha’i at that appointed time. The Will and Testament of ’Abdu’l-Baha gives two criteria that must be followed in appointing a successor of this lineage. If only one of the criteria is present then that person cannot be a succeeding guardian seated at the head of the Universal House of Justice. Shoghi Effendi had conferred infallibility, but he was not a son of ’Abdu’l-Baha. Therefore he did not inherit the Davidic lineage, and consequently he was not to have a natural son. His father was Mirza Hadi Afnan, a descendant of Muhammad. Therefore Shoghi Effendi could not sit upon David’s throne. His son was the first International Baha’i Council. Shoghi Effendi appointed all the members of this Council and placed ’Abdu’l-Baha’s son to be its president, for only a descendant of David could sit at the head of the Universal House of Justice. This is the standard (ensign) that the nations will turn to and accept. This standard will gather the twelve tribes of Israel a second time. This is the Great and Promised Day of the re-gathering of all the nations and peoples of the world under the one standard of the Kingdom of God on earth as it is in heaven, which Jesus, the Herald, and the Establisher of the Kingdom, told the Christians to pray for. This standard distinguishes the true Baha’i faith from the Covenant-breakers. This standard distinguishes the true House of Justice from all false houses of Justice—the World Court at the Hague, the League of Nations in Geneva, the United Nations in New York, and the Headless Monster of the Covenant-breaking Baha’is on Mt. Carmel. This standard distinguishes the World Order of Baha’u’llah from all other world orders—the world order of Bush and Clinton and the world order of the Covenant-breakers on Mt. Carmel. This standard separates the sheep from the goats—those that enter the Kingdom of God on earth and those that are for the fire. This standard will exist forever, as it is the Covenant of God to King David that his lineage would exist forever and that there always will be a man seated on his throne. God never makes a promise that He doesn’t keep. Baha’u’llah, a descendant of David seated on the throne of David, continued this lineage with His son, ’Abdu’l-Baha, and ’Abdu’l-Baha continued this lineage with his son, whom Shoghi Effendi placed at the head, or president, of the Universal House of Justice in its embryonic form, the first International Baha’i Council. This lineage will exist forever through ’Abdu’l-Baha’s great-grandson who is alive in the world today. The true Universal House of Justice of Baha’u’llah has this lineage as its president.